There is no additional ceremony hosting fee.Lovers' Walk - Sentiero degli Innamorati - our least expensive; yet, one of our most beautiful locations for legal, religious, and symbolic weddings in Italy - famous for its legend of the Lovers and the Mermaid. 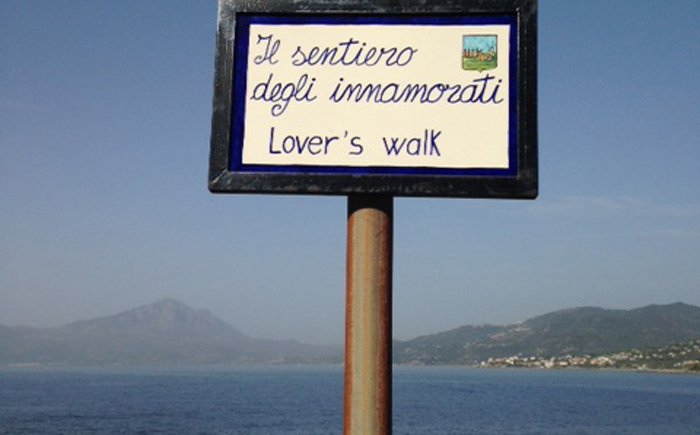 Lovers Walk begins the incomparable Coast of Maratea. There is no additional ceremony hosting fee. Plan B (in the event of rain) - iCeremony will be in town-hall. An Intensely Beautiful and Romantic Walk Betwixt Sea and Mountains. Italy is famous for its rivalries - Romeo & Juliet the most famous. The towns of Sapri & Maratea were no exceptions. The Legend of Lovers Walk has it that the young were warned not to "cohort" with others from the rival town. Centuries ago, goes the legend, a young couple, determined to be together forever, met in the path connecting Sapri & Maratea - one of the most beautiful lovers' walk on earth - Traveler Magazine says "Maratea is Heaven - It's The Amalfi Without The Crowds.... Italy's Best Kept Secret". The path meanders through fields of wild flowers and jagged rocks, edged by a blue sea and soaring mountains, etched with ancient Saracen Towers and towering cypress trees. They padlocked themselves to an old iron frame cast from the sea by a violent storm; and, defying elders, family, and jealous friends threw the key far into the sea. To ensure the key would never be found, a beautiful mermaid plucked it from the sea, and lies guard over it, even today, on the nearby Isola dello Scialandro - see deserted mermaid island. the mayor of Sapri revived the legend. At the end of the ceremony on Lovers Walk, he had Danny & Kristin connect forever a padlock to a bench at waters wedge, and throw the key far into the sea - and watch, hopefully, the mermaid will deliver it back to her deserted island. The mayor and the mermaid hope this padlock and key will not only ensure lasting love; but, will always be there to connect couples, their hearts and souls to the incomparable Sapri and The Coast of Maratea (now quite harmonious) - and the legendary Lovers Walk. Ensure an undying love! Continue the legend! And, have that relaxed and memorable wedding with the keys, the padlock & the mermaid. 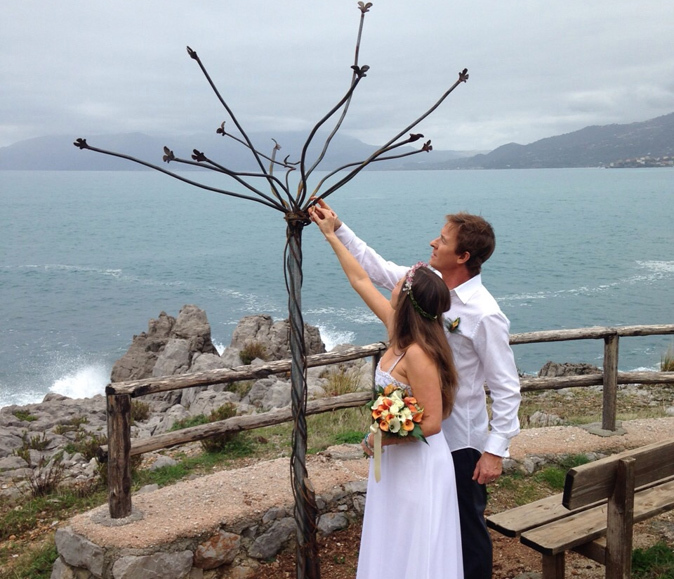 Update - In 2015, the town installed a metal tree sculpture for couples to attach their engraved padlocks "in perpetuity". Blair and Victor of Charleston, SC were the first couple to attach their "undying love" padlock.